“Note” – this term reminds one of only the famous Samsung Galaxy Note series, the best ones from Samsung in the recent few years. But that doesn’t mean it is just Samsung that uses the name, as there have been quite a few devices with similar names, and one of the notable ones is the Xiaomi Redmi Note, a phablet devices that puts itself into the budget range, with a killer pricing of Rs. 9000 in the Indian market, and that is where you hardly find decent phones that you can rely on, for a good user experience. The Redmi Note isn’t the one in the flagship series from Xiaomi, but the device deserves all the recognition it needs, thanks to what it delivers for the price. The Xiaomi Redmi 1s was one of the best budget smartphones, and the Redmi Note is linked to it, only with the changes that were needed to get this into the phablet category, for the ones who love using larger screens. A quick run through the spec list – the Xiaomi Redmi Note comes packed with a 5.5-inch IPS LCD display with 720p resolution, a Mediatek MT6592 Octa-core processor with 2GB RAM, 3200 mAh battery and a 13-megapixel rear camera with 5-megapixel front-facing shooter. All this for that price of under $200? Are you serious? well, that is how Xiaomi has been getting all its sales and hype – with the killer pricing for the specs. Of course there are a few issues you have to deal with, while holding the device in your hand – not the latest OS (it is running Android 4.2.2 Jelly Bean), no glass protection for the display, and the hefty size because this is just a few mm smaller from all sides to the Lenovo Vibe Z2 Pro which has a 6-inch display. But if these aren’t much of an issue, read below to check what the Xiaomi Redmi Note has to offer. Again, just before we start, it is necessary for you to note that the Redmi Note (3G) is powered with a Mediatek octa-core chipset and not the Snapdragon 400 processor, as the latter is packed inside the Redmi Note 4G, which is still not available. Don’t get confused about them, and just to note, the MT6592 processor in the Redmi Note isn’t bad at performance at all. Firstly, the size. This is incredibly large a device for a 5.5-inch screen. The Redmi Note is in fact a larger variant of the Redmi 1s, if we talk physically, as you would notice no big difference in the form factor. We had to compare the size to see how large is this, and the LG G3 and OnePlus One, both with the same display size, are easily smaller than this and the Redmi Note marches ahead to try and match the size of Lenovo Vibe Z2 Pro, which has half a inch bigger screen size. But we are talking of devices that are no where a match in the pricing, and Redmi Note had to come with such compromise, which are understandable. LG’s G3 is the flagship that is made with such engineering to keep the size compact and not compromise with the quality. A perfect rectangular shape with rounded corners, and flat top and bottom frames unlike the curvy ones in OnePlus One, the Redmi Note doesn’t feel awkward to hold, thanks to the curved back cover. The bezels around the display are wide, and there is quite some space wasted below the display area, where the capacitive navigation buttons are located. On the top, you see the sensors and camera on the either side of earpiece. The physical buttons are located on the right frame that continues from the back cover, thus if you pull out the back cover, it takes those buttons out as well. The Chinese Redmi Note has got some color options for the back cover, as it is removable. But the Indian one, for now, is only the white back with glossy finish which takes up all the fingerprints at will, and does look ugly, asking for a cleanup regularly. The MicroUSB port is placed in the bottom, alongside the microphone, and there is a secondary mic beside the 3.5mm headset jack on the top. The two SIM card slots and the MicroSD card slot are located under the back cover and you need to remove the 3200 mAh battery in order to remove the cards from their place. All in all, the Redmi Note does not obviously look like one of those classy devices out there, but we don’t expect that from the phone made for budget-minded users. It is still comfortable to hold, no sharp edges and looks neat, except for the back cover. The Redmi Note has a 720p display under the 5.5-inch screen, and that gets it a pixel density of just 267ppi. Not very great at that part, but it is bright, having good viewing angles. The touch response is great as well. The only point to notice here, is that Xiaomi has not given the screen any protection with Gorilla Glass or such, thus you will have to take proper care from scratches or fall. The display though, looks great and better than the one on Redmi 1s, which fails in comparison under the bright sunlight. In darker conditions, you should be happy with manual brightness setting of about 30%, and the brightness in all conditions is better on the Redmi Note when compared to the 1s. We recently have seen devices that are coming with the setting where you cannot unlock the screen when something is covering the proximity sensor. Same is the case with Redmi Note, which prevents pocket dials, only if you set it up. Contrast is not the best though, on the Note as it fails to get more contrast than the Redmi 1s and some other devices in comparison. Color reproduction is good, and overall, the graphic content of 1080p resolution plays and looks very well on the display of the Redmi Note. 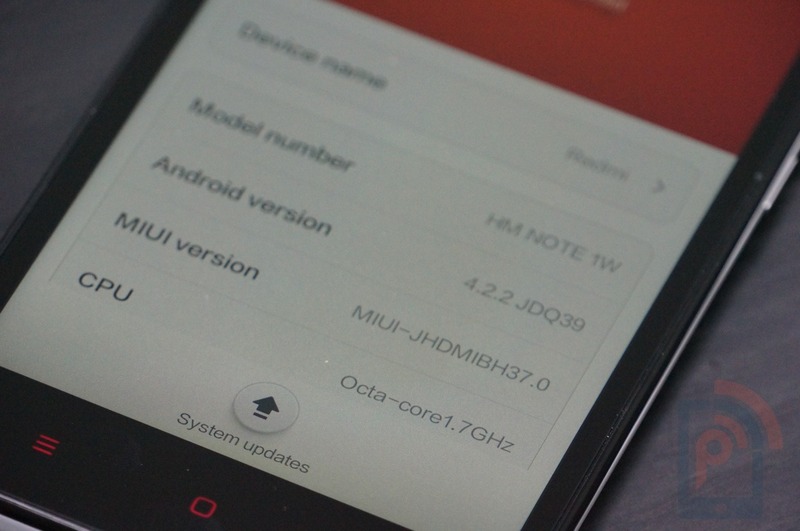 The Xiaomi Redmi Note runs Android 4.2.2 Jelly Bean with MIUI v5 layered over it, just like the other Xiaomi smartphones did. No surprises there, the MIUI looks like a mixture of iOS and Android as you don’t see any app drawer, but still place widgets and shortcuts on the same home screens where the app icons are located. While the Note doesn’t come with those intuitive features for geeks, it isn’t the easiest ones for non tech-savvy people. Thus, there is a mode called Lite Mode which makes the icons larger and the interface far easier with limited options. This helps not only those who don’t want a cluttered UI, but also for someone who doesn’t want to strain their eyes watching the large screen with little fonts. Though this isn’t like one of those modes which changes in a couple of seconds, as the device needs a reboot to shift. The Indian variant of the Redmi Note comes with the Google package pre-installed, but if someone bought the Chinese device, nothing to worry because it can be installed using the Mi Market. Xiaomi is not pre-loading it for you, but it is also not restricting you from installing those Google apps which one might feel a need for. The Lock screen is as always, interesting. Double tapping the little circle turns the lock screen into a music control screen, while tapping and holding the circle presents the four options – Camera, Phone, Messages and Unlock. For the first time users, you might have to give this some time to explore the features. A quick interesting one in the list – tap and drag your finger on the Music app icon, it will open a pop-up widget there itself for quick music controls. Moving and uninstalling apps is very easy, and you just need to tap and hold to get control on the icon and move it across the different home screens. 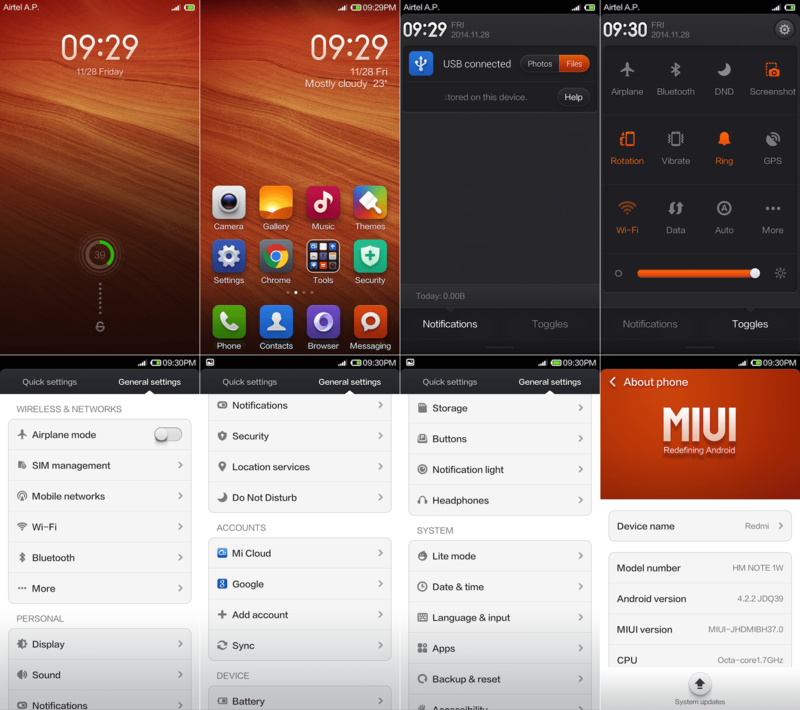 There is a Themes app using which one can download MIUI themes. The notification panel shows the data usage and swiping the panel to the right shows up the full screen quick settings. These quick settings can be set to show as a bottom bar in the notification panel. You can read the Xiaomi Redmi 1s review to know more about the MIUI as it is no different, and no point repeating the story. Xiaomi has provided an excellent camera combo, a 13-megapixel rear one and 5-megapixel front-facing camera. The company hasn’t settled for any low-end compromised camera, and chose to come up with a very decent one. It although doesn’t have the OIS or anything extra-ordinary, the capturing is not disappointing at all. The camera app interface is very simple, with options available at ease. The left corner has all the camera shortcuts, and the right has the shutter button, shortcut to preview and the menu button. The options include Panorama, HDR, Hand-held twilight, Focus mode (auto, macro), ISO (auto, 100 to 1600), Exposure, White balance (fluorescent, daylight, incandescent, AWB and cloudy), Filters (mono, sepia, negative, aqua) and Scene mode (Auto, Portrait, Landscape, Sports, Night, Night Portrait, Beach, Snow, Sunset and Fireworks). Even if these look confusing already, the settings have a toggle to switch between Simple mode and Advanced mode. Video recording is possible to a maximum of 1080p resolution, and there is an option to choose whether you want to capture a picture while recording a video. The focus can be set to “tap” or continuous autofocus. A few other settings and you are all good to capture some good photos, with neat colors. The Panoramic captures disappoint with a maximum resolution of 2300 x 400 pixels, while the normal captures come out at 3000 x 800 pixels in portrait mode. Overall, the camera quality on Redmi Note isn’t something you might be seeing on similarly priced smartphones, and this beats all of them in the competition. Pictures look brilliant, but the phone has to be stable to take good ones. Color reproduction is great and HDR doesn’t do a great job in making it even more natural than it is already. Colors and contrast in the 1080p videos captured at 30fps are decent, and the video quality isn’t the best because there is no optical stabilization and the shakes are quite visible. The Mediatek MT6592 octa-core processor runs all the eight cores at the same time, and these are Cortex-A7 ones clocking at 1.7 GHz, and there is Mali-450MP4 quad-core GPU along with 2GB RAM. This is what you are going to see as a configuration in the Redmi Note 3G in India, while in China there was this along with a downgraded version with 1.4 GHz speed and 1GB RAM. Talk of actual performance, the Xiaomi Redmi Note is swift, very responsive and half the credit goes to the well optimized interface. And surprisingly, the benchmark scores are more than what one might expect here. The flagship smartphones this year got scores of around 21000-24000, and the Redmi Note could hit the 15000 mark with ease. Not the best of the chipsets out there that powers the Note, but it is well optimized to deliver a good performance. AnTuTu scores have gone on steroids these days after the recent update, thus the device gets a score over 32000 in that. 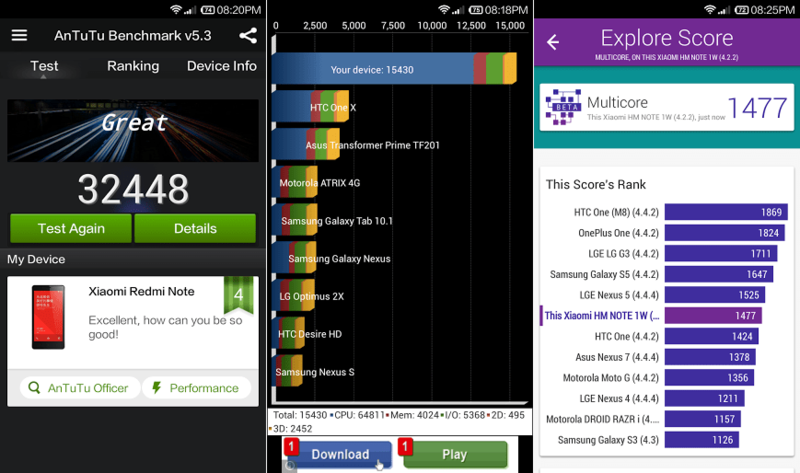 The Multicore test in Vellamo gets the Redmi Note a score of 1477, which places it just below the Nexus 5, and above the HTC One M7. The Note could play high-end games with ease, and although the plastic body with that size should be capable of dissipating the heat, it wasn’t the case that happened actually. While playing Riptide GP2 and Asphalt 8, both the games loaded with graphics, the device got heated up quite a lot within about 10 minutes of gameplay. The heating doesn’t happen when you are using the phone normally, or browsing the web continuously, but again the device is felt high on temperature when playing Youtube videos. It is more to do with the graphics. Multitasking was possible at ease, and no issues in running larger apps as well. No issues with the calls, clear and similar to the experience we had with the flagship Xiaomi Mi3. But with connectivity, you need to again keep this clear before purchasing – the device running Mediatek MT6592 is the one with 3G connectivity, and there is another variant with Snapdragon 400 processor which is not going to launch right away in India, and you need to wait till December end, if you wanted this for its 4G connectivity. The 3G data connectivity was good, no issues with Wi-Fi and Bluetooth as well. The speakers on the back aren’t at the best place, but that is fine because the output level is high. One of the best parts about the Redmi Note is its 3100 mAh battery, which is well enough for an entire day’s usage. The screen turned on was enough though, for a continuous battery drain even when there was no activity on the screen. We kept the Wi-Fi ON and background data turned “on” for the entire day, and it went on to drain about 11% battery in 24 hours. On normal usage, it went through the entire day and had enough juice left for half of the other day. And interestingly, the 2G connectivity took almost the same battery power as the Wi-Fi connection did, during our test for browsing the web using Chrome browser. The charging was quick as well, for that capacity of 3100 mAh, as it took just around 4 hours to charge using the USB charger from a computer, while it takes less than 2 hour 30 minutes for a full charge using a wall charger. Limited availability, limited regions and not already a great support by the company – these are the issues you might be seeing related to the Xiaomi Redmi Note, and these clearly aren’t handset-limited problems, and the Redmi Note is actually a perfect value-for-money phablet for those looking for something in a range below Rs. 10,000 in India. It doesn’t really face a tough competition here, as you don’t find much large screen smartphones in this range, and if any (Micromax Canvas Doodle 3), they aren’t worth it. The display is good, performance as well is, but only a little heating could make you think twice before trying your luck in the flash sale (yes, you aren’t going to get it that easily), but overall, the Xiaomi Redmi Note is an excellent unit. 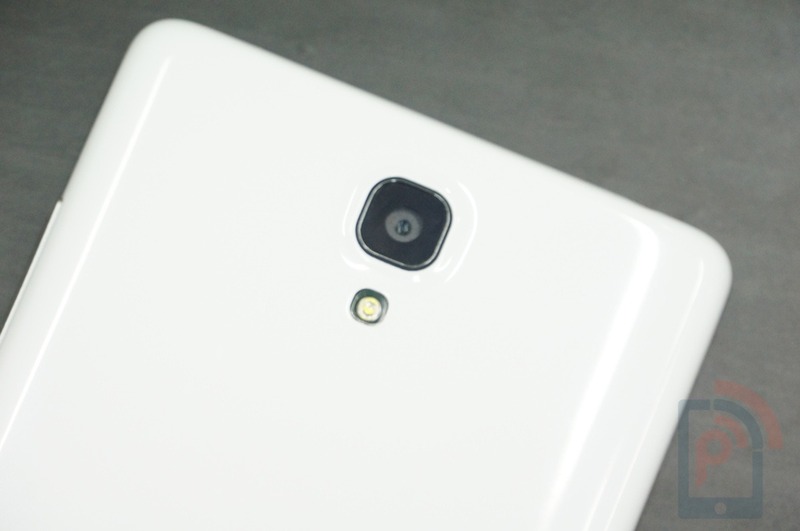 Not to forget, it has two great cameras that are almost at par with the Xiaomi Mi3’s camera.